At Streamline Print & Design, we focus on the advertising needs of the small business. While we also serve individuals and large companies, small businesses make up the biggest part of our customers. We understand that you need your printed products quickly. We know that you want them to look right. And we know that the price must fit your budget. Small businesses are founded by entrepreneurs, people of energy and intelligence who trust their own judgement and try to solve their own problems. When entrepreneurs come to us with a printing project, you know what you want to achieve, and usually have a good idea of how to achieve it. You know how you want your brochure or door hanger to look, and may have designed your own logo and written your advertising copy. Half of the good news is that we respect your judgement, and enjoy working with capable, opinionated entrepreneurs. The rest of the good news is that we generally have the skill and the experience to improve on your work. 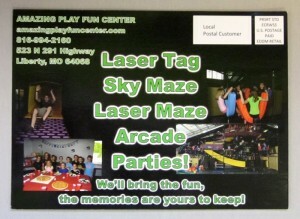 We can sharpen the look of the flyer or postcard that you have designed. And we have the resources to provide pens, coffee cups and zip drives printed with your logo and contact information. We understand that your time is precious. When you enter our store, you will get a warm greeting and answers to all of your questions. We will help you find the right printing solution and we will finish the project on time. Streamline Print & Design has the products you need to keep your business growing. We can accommodate emergencies, working early, late and on weekends to finish your project when you are on a deadline. Visit us today for high quality business cards, signs and banners.